N’Djamena, 10 April 2018 – The Jesuit Refugee Service (JRS) has worked in Chad since 2006 with the aim of serving, supporting, and defending Sudanese refugees who left their homes when the ongoing conflict first broke out in 2003. With the chronic nature of the conflict in Sudan, different UN agencies and NGOs gradually began to reduce aid, channelling it to other, more recent conflicts. The return of refugees to Sudan is virtually impossible for the time being and within this context, promoting the autonomy and integration of refugees in Chad has become a priority. 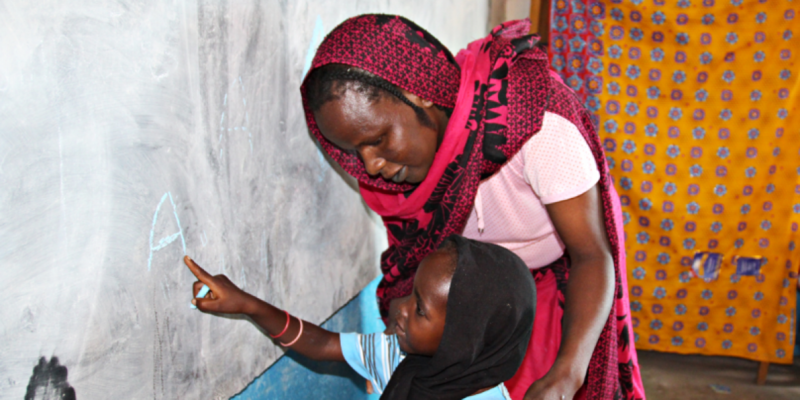 One of the main problems affecting the integration of the Sudanese refugee population in Chad is that most of the Chadian education system is only available in French. This makes it very difficult for refugee students to go to university, even if they have obtained a baccalaureate, because most of them only speak Arabic. Post-secondary education plays an essential role in promoting integration which is why, two years ago, JRS implemented a strategy to guarantee the professional and educational integration of refugees in various ways. The strategy included the development of a 3-year scholarship program at the ENS (Teachers’ Training College) through which 60 refugees can obtain a degree recognised by the Chadian State which certifies them as Chadian teachers. Additionally, JRS offers computer courses at two Arrupe centres, giving students the opportunity to develop computer knowledge, and French courses at different levels. Thanks to a recent collaboration with the CALF (French Language Learning Centres), beneficiaries have been increasingly able to pass the DELF (Diploma in French Language Studies) exam in the camps. In 2017 alone, more than 1,800 students were educated as part of this program, of which more 25 percent were women. More than 10 percent of these students were Chadian, as encouraging the participation of the local population in these initiatives contributes to improving coexistence and integration in the community. Ammar is a clear example of the importance of post-secondary education in the lives of refugees. He is 20 years old and lives in the Djabal camp in Goz Beïda, Chad. Besides being a trade student in mechanics, he is also a student in JRS’s French, English, and computer classes. Thanks to what he learns in his courses, he can increase his knowledge of mechanics by downloading videos and tutorials that are in French and English. His dream is to go to university and study medicine, but for the moment his economic needs make that impossible. In 2018, JRS’s post-secondary education strategy will focus increasing the number of scholarships available by creating of new vocational training partnerships, allowing new generations of refugees access to high-quality French and computer science courses, and by looking for ways to expand these activities to other areas in Chad. The integration of refugees in Chad is an increasingly urgent need and post-secondary education is one of the most effective solutions. It is vital to continue to sustain and improve programs that support integration.